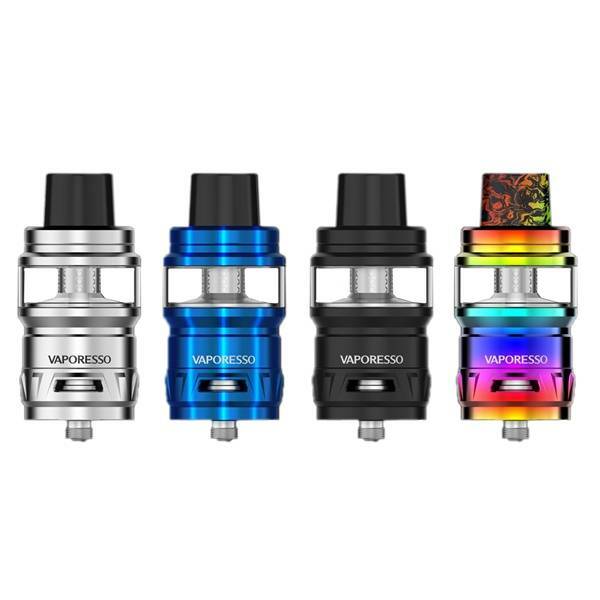 Vaporesso Cascade Sub-Ohm Tank is a 25mm, slide to fill top fill system, capable of holding up to 7ml of your favorite E-Liquid, features an EUC style coil replacement system, and a triangular, triple airflow system. The Cascade Sub-Ohm Tank utilizes the GTM Coil Family, including a 0.4 ohm GTM 2 head and a 0.15 ohm GTM 8 coil head. The GTM 2 coil head is a vertical coil, rated for 40 to 80W while the GTM 8 coil head is a quadruple vertical coil, rated for 80 to 200W. A GT Core adapter comes with the package allowing users to utilize their prefered GT core coil head. Airflow enters the Casscade Sub-Ohm Tank via Triple adjustable bottom airflow that is fully closeable and has an extra heating insulation layer. An 11mm bore delrin drip tip sits atop the tank. Within the tank is an innovative Isolation Structure Design; the isolation structure design separates the coil and e-juice chamber, allowing consistent flavor and reduces dry hit potential to extend the tanks life cycle. With its large tank capacity and ease of use, the Vaporesso Cascade Sub-Ohm Tank goes "above and beyond" the other sub-ohm tanks on the market.